God created man with body and soul (Gen. 2:7). Did not the Father plan that His Son would be the Spirit completion inside of us from before the foundation of the world? What made fallen Adam tripartite with Satan? Why would Satan never fully complete or satisfy man? What was the significant exchange at the Spiritual rebirthing? How is walking in the flesh not fully tripart in expression? How does Christ in us fulfill the walking in the Spirit and make us fully tripartite? Let us allow the Holy Spirit reveal Christ and His completeness in us for the fulfillment of I Thessalonians 5:23-24. "And I pray the God of peace Himself may once then fully purify you completely; and I pray that you may once then be blamelessly kept sound in the spirit, and in the soul, and the body, in the presence of our Lord Jesus Christ. Faithful is He ever calling you, who also will hereafter do it" (I Thess. 5:23-24, author's translation). "The Lord God formed man out the dust of the ground (the body), and breathed into his nostrils the breath of life (His Spirit); and man became a spiritual soul" (Gen. 2:7, author's translation). The Lord God created man soul and body to begin with. This is the real man, Adam. While the Lord God breathed into Adam to spiritually provide him natural life, this does not constitute the Spirit that God planned to give mankind. The Lord God created man with an empty spirit void to be filled one day by Himself. 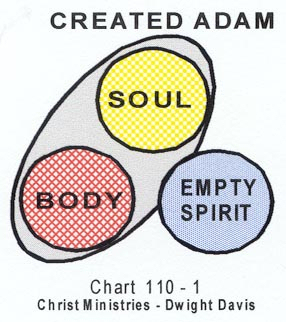 Chart 110 - 1 shows Adam in his created state. When Adam simply believed Satan and his lies, he received the Satan Nature that moved into the empty spirit void. 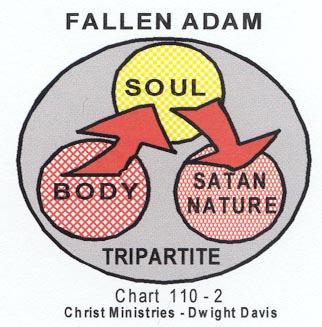 When Adam fell, he became a tripartite being, as shown in Chart 110 - 2 above. Since Satan is not Omni-present, he could never live inside of man to completely fulfill the spirit part of man. However, he could leave his temporal lying seed and nature within man to infect all members of the Adamic race through Adam's original sin (Rom. 5:12). Fallen Adam would now operate as a self-for-self, which is the nature of Satan himself. His body would be led by his own unregenerate mind that would operate out of the knowledge of good and evil. Adam's soul consisted of his own mind, emotions, and will. That soul would be continuously led to the Satan nature that moved into his empty spirit void. This Satan self-for-self nature is used by Satan's demonic forces to express Satan's spirit and works through mankind as sons of disobedience (Eph 2:2). This temporal Satan nature within man would never fully satisfy man within all his quests of lust, pride, fame, and fortune. The Father desires to have Spiritually rebirthed sons in a love relationship and fellowship with Him. This is why the Father "chose us in Christ before the foundation of the world" (Eph. 1:4). Our eternal life relationship and fellowship is all – by, in, and through His Son (I Jn. 5:11-12; Matt. 11:27; I Jn. 1:3). The Father created us as a soul in order to have a mind, emotions, and a will to freely choose our relationship and fellowship with Him. This allows our relationship and fellowship with our Father to be out of love and not a forced choice upon us. When we are Spiritually rebirthed, the temporal Satan Nature is removed completely and the eternal Christ Seed, Nature, Spirit and Person is placed inside us (I Pet. 1:23; II Pet. 1:4; Rom. 8:9; Gal. 2:20). See both charts 110 - 3 and 110 - 4 below. This is now possible because Christ is Omni-present and He can live within every member of the many-membered body of Christ. In Christ "dwells the fullness of the Godhead bodily" (Col. 2:9). Therefore, we have the Holy Spirit and the Father indwelling us also. The Father is for fellowship in the Spirit – in intuition, conscience, and communion. The Holy Spirit renews the soul – the mind, emotions, and will with the Word of Christ (John 14:26; 15:26; 16:13-15). The Holy Spirit reveals out of the eternal knowledge of life, not out of the temporal knowledge of good and evil (I Cor. 2:9-14). Through Spirit fellowship with the Father, with the renewed mind, Christ is expressed through us with His love-for-others Spirit and Nature. Spiritually rebirthed sons still exercise their choices in their walk. 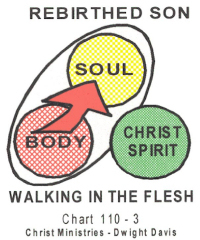 Walking in the flesh shuts off the nature and Spirit of Christ who lives in them, as illustrated in Chart 110 - 3 above. There is no fellowship with the Father. Walking in the flesh lives to the pulls of the unrenewed mind. Bodily self-for-self sin expression comes forth instead of Christ. 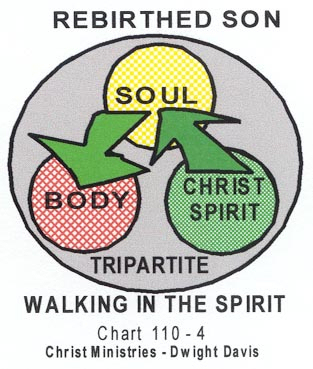 Walking in the Spirit, as illustrated in Chart 110 - 4 above, shows man truly walking as tripartite. Fellowship with the Father in the Spirit, allows Christ to flow out of the renewed soul with expression out of the body in His love-for-others Spirit. Christ is the only blameless Spirit in us. Christ living in and through us is the ONLY fulfillment of I Thessalonians 5:23-24.